My sister and I took a much needed to trip to Boerne, TX back in September. I posted a few things already from the trip, but wanted to do a Small Town Charm post for a guide to the city. Boerne is one of the most adorable and charming cities I’ve ever seen. I really fell in love with it when I was driving back to Houston from Bandera this Summer. All throughout my twenties, I thought I would forever live in a big city. However, over the past three years, I’ve been drawn to a simpler setting. Boerne is on my top five list of beautiful small towns to live in. We started the weekend off by renting a cabin from AirBnB. This is my second experience with it and I have to say, it’s really one of the best ways to travel. The hosts have excellent recommendations and go the extra mile to give you a place that has a homier feel than a hotel. If you want to see more pictures about the property we stayed at - you can check out this post. I wrote and entire post about this here, but Cascade Caverns was such a highlight for us over the weekend. We spent an hour walking around the outdoor trails and then completed a 45-minute tour of the cave that took us 80 feet below. It was a really interesting historical lesson and a perfect way to beat the heat since it was in the nineties during our stay. There is camping and an RV park if you are looking to stay on the property. Plus, the drive out there is really lovely with all of the farm land and ranches surrounding. It’s also really close to Boerne’s downtown area. Cibolo Creek Nature Center was the perfect place to stroll Sunday morning. The creek has a paved walkway along one side of it and stretches pretty far for you to take a stroll. The morning was filled with a layer of fog rising when I first embarked upon the trail, but quickly dissipated as the sun rose. The creek was really beautiful with trees acting as a canopy alongside the bank of the creek and there were ducks swimming all around. Boerne also has a really lovely downtown right off the Cibolo Creek Nature Center. It's a perfect spot to grab coffee and then pop in and out of really cute shops. 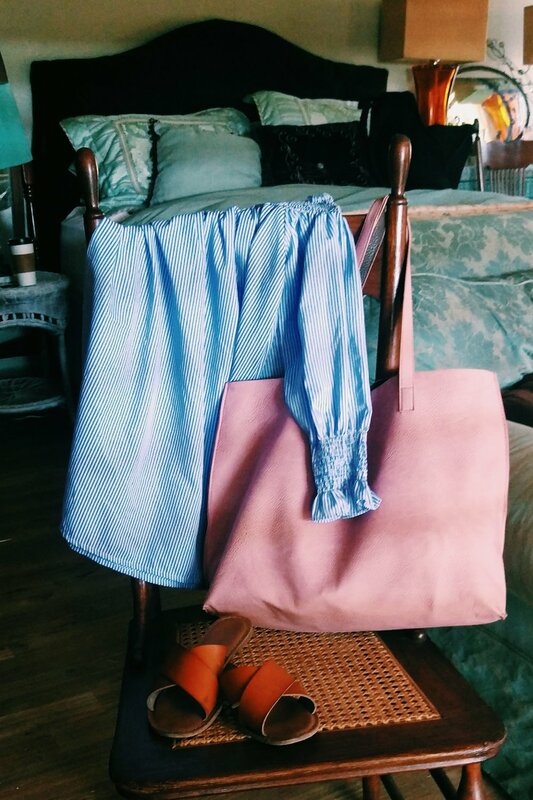 From vintage to old time themed stores, there is so many fun things to look at whether you are there to shop or not. It is a great place for an afternoon to just relax and leisurely walk. We ate a variety of places but started both mornings off by grabbing a delicious Lavender White Chocolate Latte at Bear Moon Bakery Cafe. Located in the downtown block right off Cibolo Creek, you can grab a cup and then head over to walk along the water. They also had a variety of pastries and breakfast items. The staff was so friendly and the quality of their coffee was remarkable. If you are looking for a good brunch place, they have a full breakfast b on Sundays! For lunch we had a perfect time at 259 Brantley’s Bistro. After a long walk at Cascade Caverns, my sister and I changed clothes and headed to the Bistro. We ordered a huge Farmer’s Board complete with fruit and cheese, the best Bread and Butter Texas Jalapeno Dip (with salami chips), and Fish Tacos. We also ordered fresh pink lemonade and a fruit bowl with crème fraiche. We ate until the feast was completely gone and then headed to do some vintage shopping. On Saturday night we decided to visit the Cypress Grille for dinner. They have a really beautiful setting with warm wooden floors and high ceilings. We began the meal with a Warm Spinach Salad cranberries, gruyere and bacon sherry vinaigrette. Then, we ordered the Eggplant and Potato Lasagna which was so delicious! It had seasonal squash and Portobello mushrooms. A hearty, but vegetarian option. Finally, we decided the meal was complete without dessert. My sister ordered the Vanilla Bean Crème Brulee and I ordered the Warm Bittersweet Chocolate Cake. From the attentive service to the high quality food, the Cypress Grille did not disappoint. For this trip, I brought an assortment of casual clothes. For a few outdoor activities I wore my DIY Cut Off Shorts with two different linen tops. I really love the look of the long sleeved and it’s lace up detailing. The second look was where I pulled out my Peter Grim straw hat and Hunter Rain Boots for an afternoon of hiking around. When I travel, I try to bring what packs easily and what I will be comfortable in. 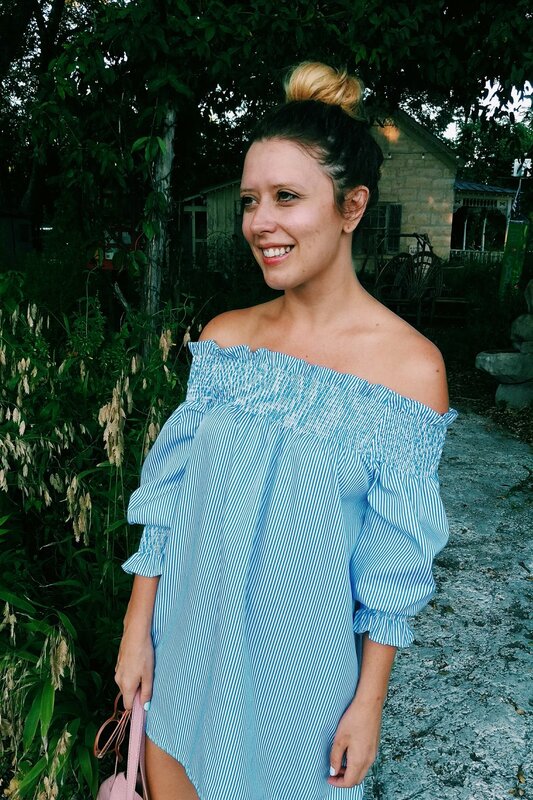 This off the shoulder top I found was perfect with a pair of simple flats for dinner at the Cypress Grille. Being that we didn’t take a lot of time to get dressed, I wore my hair in loose waves, pigtail braids or a simple top knot for a quick change. A lot of the time when I’m doing outdoor stuff, I just don’t take the time to get all dolled up. I’m all about what’s convenient for the activities we will complete. Boerne ended up being such a beautiful place to visit with some of the nicest people. The waitstaff at each restaurant, our host and local shop owners were all so kind and helpful during our stay. We had the best time and had a chance to see so much throughout the weekend we were there. 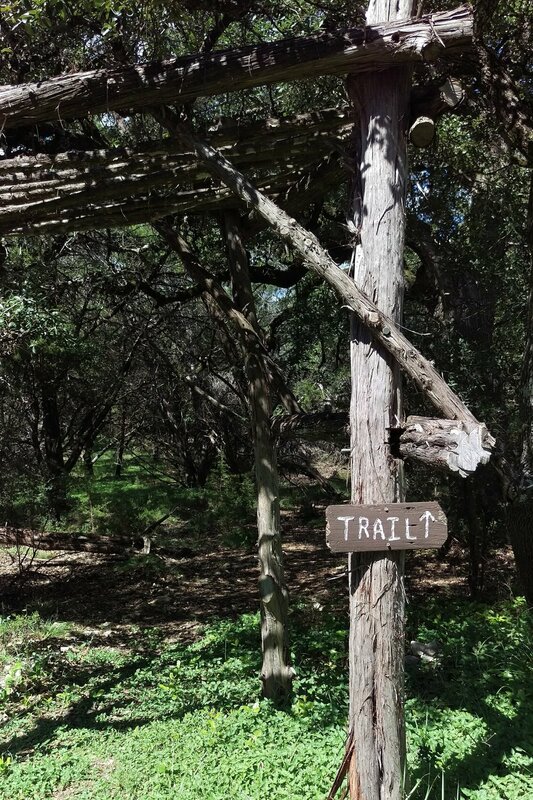 Hopefully, I'll get a chance to go back in the future, but if you are looking for a little weekend getway, Boerne's a great option outside of Austin and San Antonio!